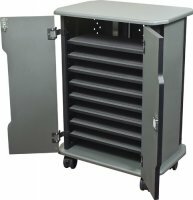 This Economy Mobile Laptop Charging and Storage Cart and Workstation - Stores up to 16 Devices - Multiple iPad, Tablet, Laptop, and Notebook Charging Station/Security Cabinet - Locking Doors is the best solution to charging and securing up to 16 Laptops or tablets. Perfect for offices and businesses that use a large quantity of mobile devices. Just put your laptops or other devices into the cart and lock it. In a short amount of time they will be fully charged and ready to use! 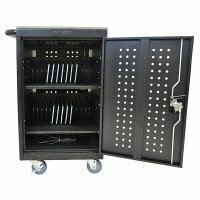 This mobile charging workstation makes transporting your laptops or iPads easy and safe. 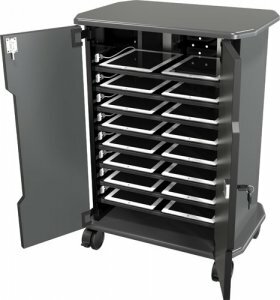 Eight shelves (2.5"H x 11.19"W x 14.91"D) hold two devices each. Body constructed of wood with ventilated metal back door. Includes 3" casters (two locking).